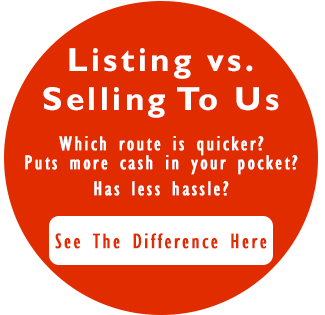 The Easiest Way To Sell Your House Fast In Indianapolis Is To Sell Direct To A Professional Home Buying Company. Talk To Us…Because We Buy Houses All Around Indianapolis (At Any Price & Any Condition). We are professional house buyers. We are a professional home buying company. This is what we do. And we will give you a written fair cash offer quickly. No waiting for months wondering if an agent will be able to find a buyer. Stop unwanted frustration with your unwanted property. You will NOT be asked to do any repairs or even clean the place. Give us the chance to buy your house now, regardless of it’s condition. Are you facing any of these house problems? Is your bank about to foreclose? Are you behind in mortgage payments and can’t get caught up? Are you tired of being a landlord for someone else? Do you own a vacant house that could be broken into? Did you inherit a property that you just want cash out of? Do you want to avoid having to pay high commissions to a realtor? Do you need to sell a house you own with your ex? Are you tired of fixing up a “fixer upper”? If you are going through one of these stressful situations and need to sell your house fast for cash, we can help! We are specialists at solving real estate problems. We help people get out of stressful situations everyday. And we would like to help you get back to living the low stress life you long for. You deserve to know all of your options. And you deserve less stress in your life. That’s why we’ve made the house selling process easy and simple. No hassles. No waiting months. No pressure. No obligation. Sell Your House Fast For Cash today and stop unwanted frustration. Send us information in the form below and we’ll get back to you fast (usually within a few hours) – we’ll give you a call and show you the options to help solve your current situation. All of this 100% free to you. No fees. No commissions We will never ask you for a credit card. In fact, when we buy a house, we usually pay all of the closing costs to make it easier for the seller. That’s how we roll.